I should have really set these articles to update in the morning, because it means that me wishing my sister a happy birthday will only be up for a couple of hours on her birthday. On the other hand, maybe my gift to her is to extend her birthday for another 24 hours, and maybe some of you might want to check her blog out. She amuses me. Had the photographer for the Globe and Mail drop by on Saturday to take a few pictures for the article that Haley Cullingham is writing on my ad. Had some fun with it...and it made me want a smart phone more than ever. If the shot gets used (and if the article makes it) then you'll know the shot I mean. In other news, thanks to the ever loving snowblower ad, a really neat opportunity has landed in my lap that I'm really excited about. It may not go anywhere, it may fizzle and fall on its baby face (which is both cute and horrifying if you think about it), but it's got my foot in the door. I feel a little awkward in talking about it, because it's something that's not even in the development stage yet - unless you count me trying to get it on virtual paper as development. It's an interesting idea based on a piece of art that was sent to me, and I think it has potential. It's my first time attempting something like this, so I've got my fingers crossed. Not really though, because I'm a touch typist, and doing this with my fingers crossed would not be fun. I've also managed to score some freelance work, which isn't going to pay the bills, but it just might pay for pop and chips for the party that I'm going to have when I make my first sale. More on that later. So I was working on this freelance project which involves an app. I was bemoaning the fact that I was going to have to do this project off of screenshots and videos because I didn't have a iPhone/iPad or an Android device. My wife took a moment to look away from her text books to ask me "Are you really serious about this?" "Yes," I said. "I really am." "Merry Christmas," she said as she pulled out a Kobo Vox eReader from thin air while a children's choir that I hadn't noticed earlier started singing "Hallelujah!" in the background. Then Alan Rickman showed up and narrated the boot sequence and walked me through the setup. Okay, fine, it didn't happen exactly like that, but it was pretty intense for a while. My lovely wife is very lovely. And that means I now have an Android device! If you have an Android app that you need Blognostified and/or Snowblowerered Guy'ded, I'm your man. For a price. I'm easy, but I'm not cheap. Oh, man, am I easy. ...Tell your wife she's a lucky woman to have a man with a sence of humour. Hope you sold your snowblower. I tell my wife this every day. She says that she's more in love with me for cleaning the cat litter. That's my job, and I do it well. This whole writing thing is more of a sideline that I use to explain why I can't empty the dishwasher right now. This is the best ad I have ever seen! I am in Alberta but if I was in your area I would buy this simply because your ad displays a type of awesome rarely seen. The type of awesome that only the likes of Chuck Norris or Mr. T. could handle. Well done sir... well done. Chuck Norris and Mr. T would have purchased the snowblower, but snow doesn't fall on them. They fall on snow. This person HAD to be Canadian. Only a Canadian would accidentally whack a bunch of keys and hit send, then take the time to reload the page and send another message apologizing TWICE for the mistake, and offering up a compliment. Go Canada! FINALLY! At last, somebody has acknowledged that all the time I spent playing RPG's instead of dating girls has paid off. I am, indeed, the coolest person. EVER. What does it say about me that I wish that the person who sent this to me used the proper form of "you're"? A member of the Kijiji community recently informed us that your ad entitled "11HP/29" Snowblower" might no longer be available or current. If your ad is no longer available or current, please delete your ad by clicking here. If this is not the case, please keep your ad active on the Kijiji site by clicking here. If you do not click any of the links above, your ad will remain active on the site but might be removed by a member of the Kijiji customer service team, if necessary. Okay, relax, I'm putting this up as a joke. Kijiji has advised me that they will not be taking the ad down - it's generating good publicity so they're very happy with it. They also said that they cannot disable this because the button that triggers this is a function of the site. It's a user-generated issue. So everyone, please, please stop pushing that button? Huh? For me? Come on, Puddin', you always were my favorite you know. Yes, you are. Oh, yes you are! Now stop clicking the damn button. I'm not belittling anyone who looks up to me - after all, I am an incredibly charming and handsome man - but I had to pause and consider this. What if I really was this young lady's hero? What if she's expecting more of me than I can offer? I'm just a man who used to own a snowblower! I thought I was doing pretty good just cleaning the cat litter on a regular basis, what am I suppose to do about this?! Then I remembered that it's the Internet, and it probably wasn't a young lady anyway so that made me feel better. More awkward, but better. I had to reply to this one. I think we're gonna be all right. You sir, are a master of kijiji, general mercantilism, and the entire internet. Oh my god! How can he see me? Can you guys see me? Cause this guy can see me and it's freaking me out. How did he know? HOW DID HE KNOW?! I deeply admire you! Will you be my English teacher? Oh and, I saw you on the news today! In case you get famous, I would love an autograph! Thank you for sending me your kind words. I don’t think I’m qualified to be anyone’s English teacher, but it was always my favorite subject in school. I read all the time. I am the Snowblower Guy. Yes, that Snowblower Guy. Did you know that Christy is probably one of the best friends that you’ll ever have? She is. She was willing to find a way to get all the way from Toronto to Moncton just to buy my snowblower for you. Now, I don’t know if you know how far away that is, but trust me, that’s a heck of a long walk. It’s tired me out just thinking of it. And yet, here’s your friend, Christy, who wanted nothing more than to get you what you wanted for your birthday. That’s Spongebob and Patrick level of friendship (only without all the water and hopefully you have nicer neighbours). That’s Frodo and the gang going into Mordor level of friendship (only hopefully without all the drama and death and weird ghosty-devil things chasing you around). That’s Batman and Robin level of friendship (only I hope you have a happier family life). Yes, Christy’s Friend, who’s birthday is December 4 (which is the day before my sister’s birthday, so this was a timely reminder that I must call her), your friend Christy is indeed an awesome friend. I would hold on to her. She’s going places. She’s quite obviously extremely bright, has a great sense of humour, and probably smells nice too – and since you’re such good friends, it probably means that you are all those things too! I can’t believe my luck talking to two such awesome people! 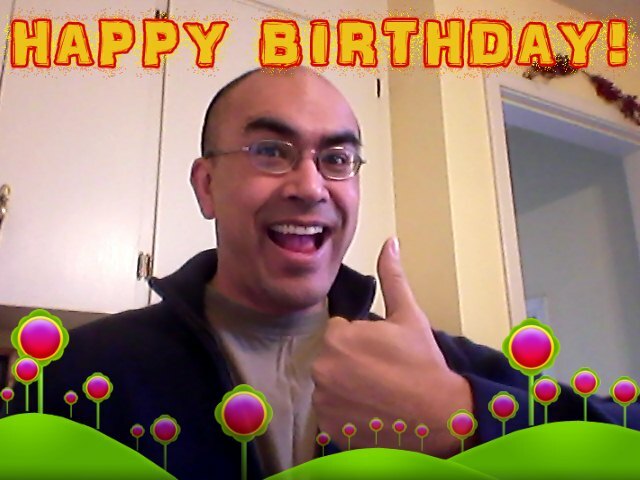 In conclusion, Christy’s Friend, I hope you have an awesome birthday. Shine on you crazy diamond. My lovely wife was not as amused by this as I was. That's all for now Blognostifans. I've got something pretty neat, or at least I think it's pretty neat, on Wednesday. So stick around! Actually, go do something else for a little while, then come back. I don't want you just hanging around waiting in your pyjamas like that. Go take a shower, come back in 24 hours, deal? Or go read some of my earlier stuff. Some of it is pretty decent. Thanks for the birthday/blog shout out! Love the birthday greeting! The pic is just icing on the cake. @jason - not only is that but my hand is larger than my head!